At PlaygroundEquipment.com, our goal is to provide customers with safe, high-quality, affordable commercial playground equipment. By collaborating with manufacturers of the top brands of playground equipment, we can bring you the most in-demand play structures for your kids’ playground while still keeping our prices low and affordable. We only use the highest-quality materials for our kids’ playground equipment, and all of our outdoor plastic material is made with UV inhibitors that increase the life of your products. Our excellent commercial play structures are built to bring children enjoyment for many years to come! With our extensive selection of outdoor play systems for sale, you are sure to find the perfect kids’ playground set that fits your space and your budget. Our categories of kids outdoor play equipment separate play structures by age group, themed structures, in-stock equipment, and more. Remember, with our in-stock play systems, playground equipment ships even faster, usually within three to five days. If you have any questions about the ordering process or need help choosing from our kids’ playground equipment, a member of our team is standing by to assist you. We’re dedicated to providing superior customer service and a wealth of industry expertise, and we offer products from the top commercial playground equipment manufacturers. Don’t hesitate to give us a call at 1-800-667-0097. You can also send us an email or contact us through our live online chat. One of our certified playground safety inspectors will be delighted to help you choose a kids’ playground set or answer any questions you may have about the safety of our equipment. Whether you are looking for kids’ plastic outdoor play equipment or metal play structures, we have the right item for you. 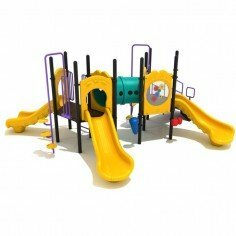 We are proud to be a top provider of high-quality, low-cost commercial kids’ play equipment. With our simple ordering process and installation and our focus on great customer service, you can feel great knowing that your satisfaction is paramount to us. We stand by our products and offer warranties on all equipment purchases as well, including each kids’ playground set in our catalog. Our shipping methods for kids’ playground equipment are designed to make sure your order is delivered quickly and in top condition. We have experience in shipping one kids’ play structure or a half-dozen or more, and we use freight service to get your oversized items delivered to you in about three to seven days. Typically, products that are smaller than play systems arrive sooner and are shipped via FedEx, UPS, or USPS. If you would like a particular shipping method used for your order, please let us know! We are happy to work with you to make your shopping experience for your park or school playground go as smoothly as possible. Our customer service team is standing by to assist you with your order of kids’ outdoor play equipment and to help you get a free quote for your purchase.